Eat Your City: Garden Cafeteria Edmonton AB - Amazing cheese buns every friday! Garden Cafeteria Edmonton AB - Amazing cheese buns every friday! Posted by I love cheese. I love freshly baked bread. And when you put the two together into a cheesey ooey gooey melty goodness of freshly baked cheese buns... I'm totally in love. I've made do with grocery store stuff, and the occasional one from family owned bakeries, but I'm always on the look out for that perfect cheese bun. You know what I'm talking about... sinking your teeth into a soft warm tender bun laced with swirls and globs of melty flavorful cheese. I've had my share of cheese buns over the years - ones made with almost endless permutations of Feta, Mozzarella, Gouda, Havarti, Monterrey jack, Cheddar, traditional cheese I have no hope of pronouncing correctly and even cream cheeses... all stuffed/rolled/sprinkled with more cheese, spinach, pizza sauce, pepperoni sticks, caramelized onions, shallots, mushrooms and herbs from all corners of the world. But I still search for the simplest of the cheese buns. Paring it back to the simple white bread base and a honest sharp cheddar cheese melted and toasted to perfection. 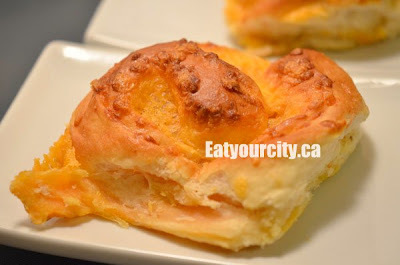 So where did I find a close to perfect cheese bun? Surprisingly, its been under my nose the whole time. Every friday morning, there is a line up for these delectable and simply irresistible cheese buns. My boyfriend has been eating them for the past eight years and he's finally sharing this secret with the world. Is it at a food truck? Nope. Is it at a local bakery? Sort of... Its surprisingly located inside a hospital cafeteria. Whaaaa?! I know, hospitals always have the stigma of having gawd awful food. But its a little known secret. If you want amazing freshly baked cheese buns, you go to the Misericordia Hospital's Garden Cafeteria in the basement every friday. That's the only day they bake these amazing cheese buns, and you better go early, as they usually sell out by the afternoon... the staff are in the know and they're only a few floors away from this super soft and molten golden cheddary bun of indulgence, where the bun is golden not because the cheese got browned, but because there is so much cheese layered and rolled up within it and on it (like a super cheesey version of a cinnamon bun!)... 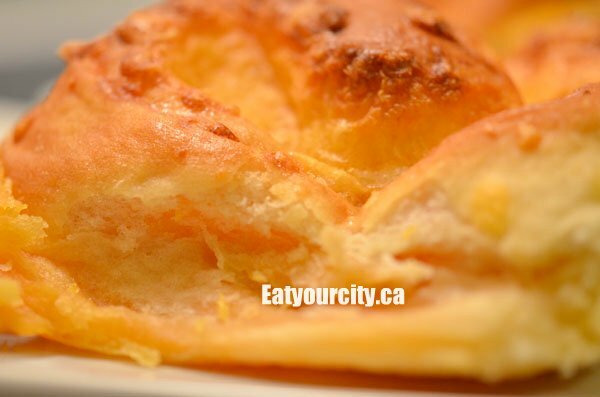 it lends its cheddary hue to the bun. Mmmmmm. Totally not sharing... go get your own! Totally not sharing... go get your own! That aside... :) Most people are used to the "know" areas they seldom adventure outside of it. In Vancouver, that would be Downtown, West End, Gastown, Yaletown and Kitsilano. I will assume in Edmonton that will (might?) be parts of Downtown, Whyte Ave and some suspects. If you dare to venture outside of those areas, you might be rewarded! Edmonton doesn't really have "food" areas like Vancouver.. hahaha.. we're not big enough on the food scene aspect of things. That said, we usually head where there are good eats - regardless if they're on or off the beaten path... I'm getting better at remembering to bring a camera along so blogging a bit more prolifically - though not always the DSLR... that thing requires its own "lunchbox" camera bag and is a pain to lug along. Wait, when I said the "known" areas, I am referring to the areas people gather together, pay $$$ for food that might be hit/miss or overrated and seen/be seen. Granted, there are some places worth the penny but a lot of them are pure hype and hot air. When I was blogging I blogged a lot about Downtown because that is where my office is located; however, if it was for me, I will be visiting more often than not some out of the beaten path. *blows you a raspberry PHBBBBBBBT! * and I'm getting voluptuous and curvaceous... not fat... get it right! Hahahaha.. I'm sure your girlfriends will find more pointed... ways to get that particular vocabulary choice outta your repertoire! LOL! I know it's not a cheese "bun" per se, but the gougeres from Queen of Tarts are delicious!